As thousands of fans checked out the Denver Broncos training camp Wednesday, Denver Outlaw’s defenseman Matt Bocklet and midfielder Josh Hawkins were in the house at UC Health Training Center and they sat down with Mile High Sports executive producer Ronnie Kohrt for an exclusive interview on their ‘win and in’ scenario on Saturday night in Atlanta. Starting the regular season with a 1-4 record, the Outlaws were able to rally by winning six straight games. Now sitting in third place in the Major League Lacrosse (MLL) standings, and the last game of the regular season approaching. The Denver Outlaws (7-6) clinch a spot into the 2018 MLL Playoffs with a win over the Atlanta Blaze. Although dropping the last two games, there is still plenty of confidence as the team heads into their season-defining final game of the season. 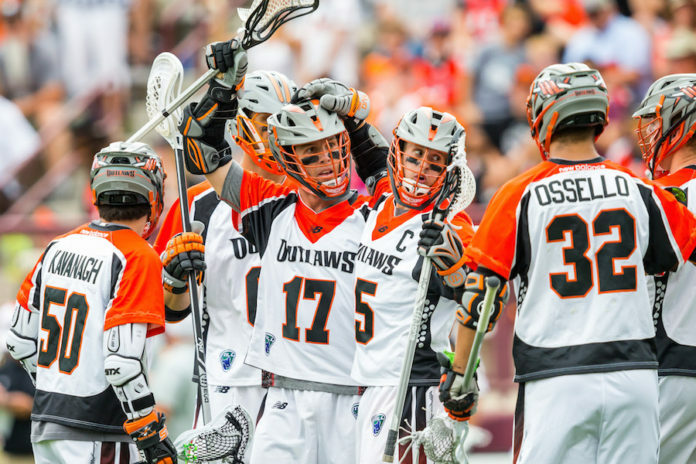 The Outlaws have not missed the playoffs since the 2015 season, and have won the Steinfeld Cup in 2014 and 2016. After winning the championship in 2016 and returning to the championship stage in 2017 against the Ohio Machine, the risk of missing the playoffs is still there — but it remains in the Outlaws hands to make their own destiny. “It would be disappointing, ” Hawkins said about potentially missing the playoffs. “As a group, we have really grown over the season and we’ve seen ourselves play really good lacrosse and we know that we can do better. We’re already playing at a high level, so on Saturday, I think we are going to play our best lacrosse”. Although winning their final game would be the dream scenario, there is also a scenario of the Outlaws still being able to qualify for the 2018 MLL playoffs with a loss — and a little bit of help with a New York Lizards loss against the Chesapeake Bayhawks. “You absolutely want to be playing your best when you are heading into the postseason. With that being said, the postseason is the postseason and I will want to go into the playoffs with this team any way possible,” Bocklet said. “It does not matter to me who we’re playing or where we’re playing, just the opportunity to have this team in the postseason I know great things will happen, but we certainly want to be coming in with that confidence and playing at our highest level like we know that we can”. 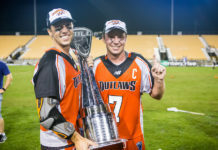 Following the conclusion of the 2018 FIL World Championships in Israel, and being given the opportunity to see how much the sport of lacrosse has grown, the Outlaws were able to become a part of MLL history this season as Outlaws goaltender Kaisuke Iwamoto became the first Japanese born player to play in the MLL a couple of weeks ago against the Dallas Rattlers. “Just recently with the experience in Israel [for the 2018 FIL World Championships] and experiencing more international lacrosse it has been cool to be able to be close with Kai [Kaisuke Iwamoto] and work with him and Toma [Toma Tamura] and have them here this Summer. They’ve been a great addition the team both on the field and off the field, so they are awesome guys” Hawkins said. With all of the eyes on Team USA and Canada during the FIL World Tournament, the Japanese flew under the radar in the tournament going undefeated in pool play and falling to England in the game to decide 5th place to allow Japan to claim 6th place in the tournament. “All of Japan lacrosse has been impressive. We saw it at the world games and they are moving up to the top bracket in four years because of the way that they played, and their dedication and work ethic is truly something that I was not expecting” Bocklet said, “a lot of the players have come to Denver this summer to be around the team, and it has been a great experience, and we are happy to keep that relationship going”. 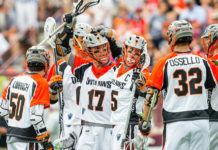 Over the past few years, Colorado has become a location of some of the best lacrosse teams in the country with the Colorado Mammoth, Denver Outlaws, and the University of Denver Pioneers lacrosse teams, launching the state to being at the same level as East Coast states such as Boston and New York in terms of lacrosse hotspots. “I think that the Mammoth and the Outlaws have a huge impact. Moving here recently, a lot of people that I speak to have heard of the two and know what lacrosse is and living in Boston on the east coast many people did not know what lacrosse is still, “Hawkins said, “I think it is kind of just the nature of the beast here in Denver right now, and it just keeps going that way”. With Denver being a large football town, everyone is attending the Broncos training camp to get a good glimpse at what to expect for the upcoming NFL season — including Hawkins and Bocklet. Although Hawkins happens to be a Patriots fan, we are sure he had a great time at the training camp for the Broncos. “I think it is really cool. I have never been to a training camp before, and it is amazing to see all of the fan support,” Bocklet said, “it would be cool to see a lacrosse training camp like this one day. It is definitely awesome to be on the field and see some of the players close up, Von Miller obviously he is a beast and I really love his game”.